Although most folks don’t want to share their hotel room with a ghost, sometimes it’s just inevitable. In fact, most historic hotels have at least one tale of a supernatural haunting or a spirit lurking about the premises. And although the word “historic” conjures up images of inaccessible stairways and narrow doors, there’s actually a good number of haunted hotels across America that offer good wheelchair access. So in the spirit of the season, here are some of my favorites. At the top of the list is the Crescent Hotel (www.crescent-hotel.com) in Eureka Springs, Arkansas — one of America’s most haunted hotels. Built in 1886, the property served as a hotel, a boarding school and a cancer hospital, before reverting back to a hotel. Today guests report a steady stream of unusual sightings in several key areas of the property. And Eureka Springs Ghost Tours offers visitors a chance to learn about the legends behind these mysterious apparitions. Best bet is to drive to the hotel, as there’s accessible parking in front with ramp access to the lobby. From there, just take the elevator to the second floor. The tour starts in Room 212 and lasts for about two hours. It covers several floors of the hotel, but by far, the creepiest part is the visit to the basement, which was formerly the morgue for the Baker Cancer Cure Hospital. Corpses were reportedly stored there until hearses came in the dead of night to collect them. There is good pathway access to all areas on the tour. There are stairs down to the basement, but an alternative accessible route is also available. If you can’t manage the stairs, make sure and make advance reservations, so they can have an additional guide on hand to direct you along the accessible route. They also ask that wheelchair-users call to make their reservations, so they can be put on the appropriate tour. 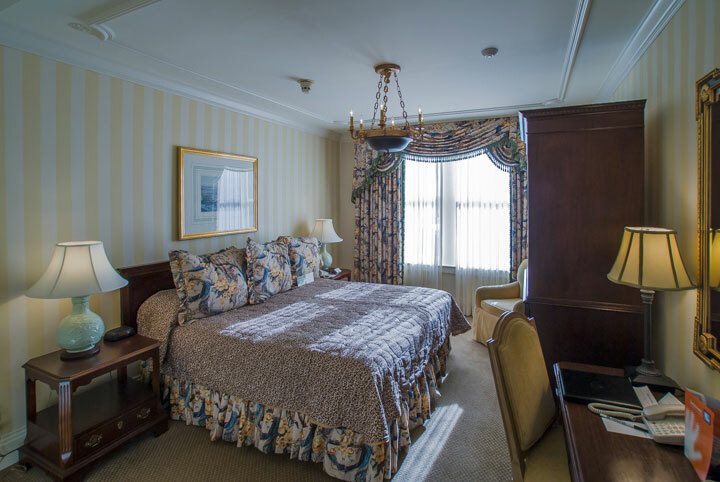 Located in the center of all the action in the Baltimore Harbor, the Admiral Fell Inn (www.admiralfell.com) is a great lodging choice for ghost hunters of all abilities. Built in the 1700s, this European-style hotel has added a number of access upgrades years, and it boasts an impressive lineup of ghostly inhabitants. 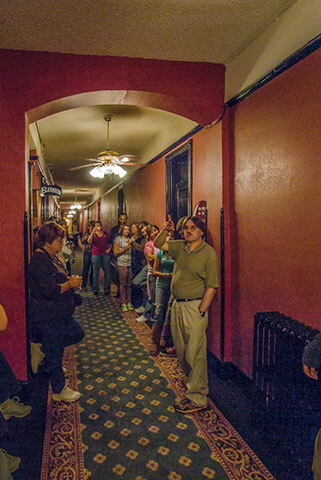 The best way to learn about the inn’s resident ghosts is to join their ghost tour. Held Wednesday through Saturday year-round, this wheelchair-accessible tour recounts stories of the folks who lived and even died there, as well as those who reportedly haunt the premises. For starters, there’s the tale of the man who died in Room 413. Then there are Bitsy and Grady who do some hard-core thumping and bumping in the night. And last but not least there’s the tale of the ghostly gathering at the property, after guests were evacuated during Hurricane Isabel. And if you’d like to overnight at the property, Room 193 is a very accessible choice. Located close to the accessible entrance on Shakespeare Street, the room features wide doorways, a lowered peephole, good pathway access and a spacious bathroom with a roll-in shower. 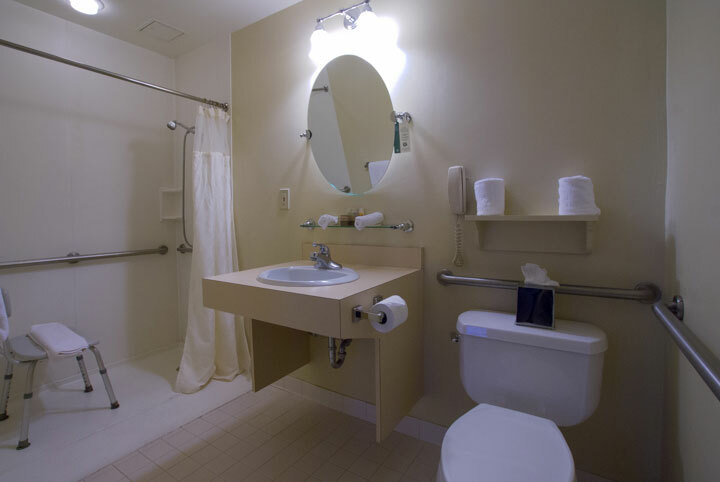 The bathroom is also equipped with a hand-held showerhead, toilet and shower grab bars, a roll-under sink and a portable shower chair. All in all, it’s a very comfortable and accessible choice. Next up on the accessible ghost hunting list is The Monteleone (www.hotelmonteleone.com), down in New Orleans, Louisiana. 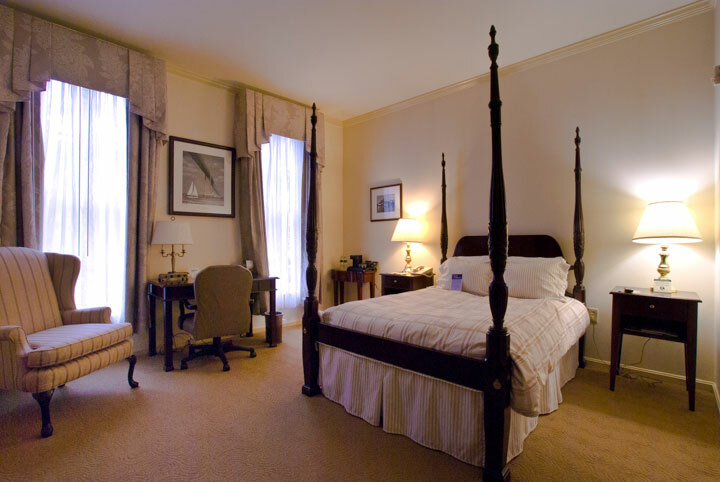 Located in the heart of the French Quarter, it’s the perfect choice for a Big Easy escape. It also has a long and somewhat tragic history, which explains the large number of spirits and ghostly sightings at this property. This 570-room property features 18 accessible rooms, including six with roll-in showers. 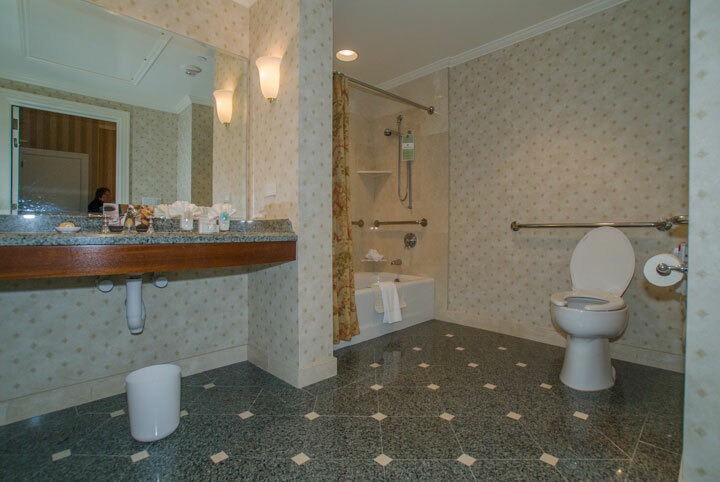 The accessible guest rooms include wide doorways and good pathway access; while the bathrooms feature toilet and shower grab bars, roll-under sinks, hand-held showerheads and full five-foot turn arounds. Portable shower benches are also available upon request. 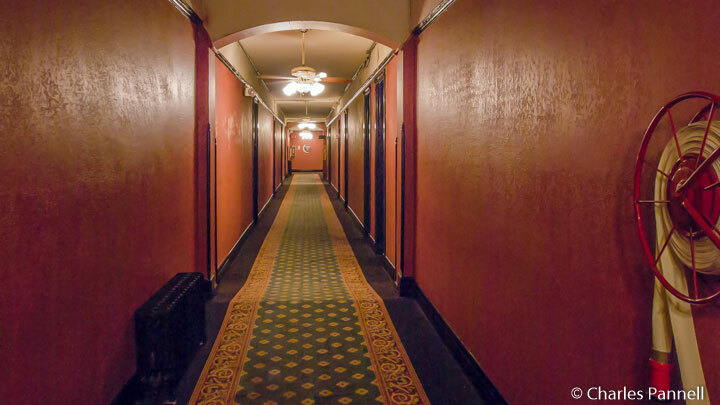 Spirit-wise, the most active area of the hotel is the 14th floor, where guests have reported seeing the ghost of Maurice, a child who died there in the 1800s. There have also been reports of ghostly children playing on the 14th floor and a mysterious doorman opening and closing the cafe doors after hours. Down in Yosemite National Park, the Majestic Yosemite Hotel (www.yosemitepark.com) – formerly the Ahwahnee — also has its fair share of ghostly happenings. Mary Curry Tresidder, who once operated the hotel, is said to haunt the sixth floor; while the strange appearance of a rocking chair has been noted in the suite where John F. Kennedy stayed in 1962. Apparently the chair was added for the president’s visit, then later taken away. Or so everyone thought. On the access side of things, the property features accessible hotel rooms, junior suites and cottages — all with roll-in showers. And if an overnight stay is beyond your budget, then stop by the hotel for the view from the back porch. Although you probably won’t see any ghosts there, you may find a few deer. But then again, you never know.